There is so much you can do with this Ladies Medieval Bodice. 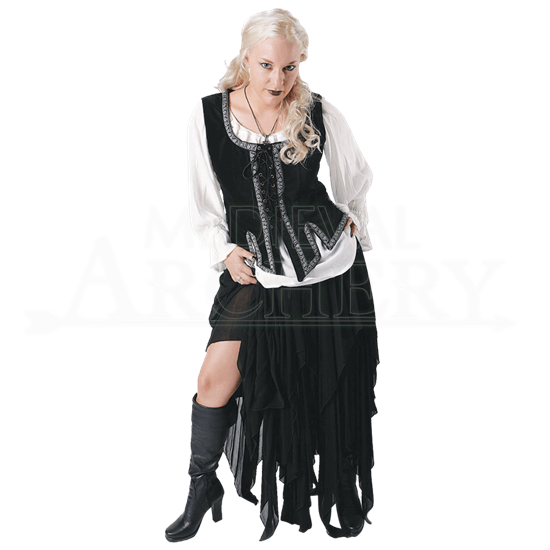 It is a garment with many uses, and it can be worn with a variety of looks, ranging from gothic nobility to royalty to pirate wenches and beyond! The bodice is completely sleeveless, and it features a U-shaped neckline that is accented with a detailed trim. This trim continues down the center of the bodice, flanking and running alongside the laced-up closure in the center, before wrapping back around on the bodices lower hem. The bodice is made entirely from rich and luxurious cotton velvet, which gives it a fine look worthy of wearing, while the interior is fully lined with cotton fabric to help bolster and enhance its comfortable fit, too. It is offered in a two sizes, as well as in a handful of different colors. It is pictured above as part of an ensemble with a skirt and blouse that are sold separately as items FX1062 and FX1099. If you want to put together a really spectacular look, whether it is gothic, medieval, Renaissance, steampunk, pirate, or any other, than you can bet that this Ladies Medieval Bodice could go a long way towards helping that look, and that makes it a key addition to any womens reenactment wardrobe.